The Department of Work and Pensions has a long track record of misusing statistics, making unsubstantiated inferences and stigmatising claimants, and it’s clear these are tactics used to vindicate further welfare cuts. The Tories have peddled the lie that he UK was “on the brink bankruptcy” and claimed the solution to is to cut government spending with a painful programme of austerity cuts. Of course, the UK economy was growing in 2010 when the Tories took over and was subsequently plunged back into recession by Osborne’s austerity policies, which have meant that the economy has not grown at all under the coalition; and for much of their tenure has been contracting. Despite the fact that Osborne was officially rebuked for this lie, the Goebbels-styled repetition propaganda technique employed by the conservatives has embedded this lie in the minds of the public. However, our current problems are the result of a global financial crisis that we and not the banks that caused it, continue to pay for. Austerity is a smokescreen – the Coalition has used the deficit as an excuse to do what they have always wanted to do: shrink the state, privatise the NHS, and hand out our money to the wealthy minority. We cannot trust them. It’s become clear that the Tories have seized an opportunity to dismantle the institutions they have always hated since the post-war social democratic settlement – institutions of health, welfare, education, culture and human rights which should be provided for all citizens. The Tories also attempt to destroy fundamental public support for the health, education and welfare of its people by a divisive scapegoating of vulnerable groups, perpetuated via the media, and by offering and inflicting only regressive, punitive policies and devastating cuts. The Official statistics watchdog (UKSA) has found that the Department for Work and Pensions (DWP) have repeatedly made false claims about the numbers of people living on disability benefits. Ministers claim that the majority of people claiming disability living allowance (DLA) were given benefits for life, and without any supporting medical evidence. This is untrue. However, the UK Statistics Authority (UKSA) found that the real percentage of claims passed without supporting medical evidence was just 10%. The DWP also claimed that “Under the current system of Disability Living Allowance, 71% of claimants get indefinite awards without systematic reassessments.” However the UKSA found that in the last two years, just 23% and 24% of claimants were given indefinite awards of DLA. The findings were uncovered by an investigation by Channel Four News following complaint by the charity Parkinson’s UK. This is the third time in the past year that Iain Duncan Smith has come under fire for the use of false statistics to justify cuts to benefits. 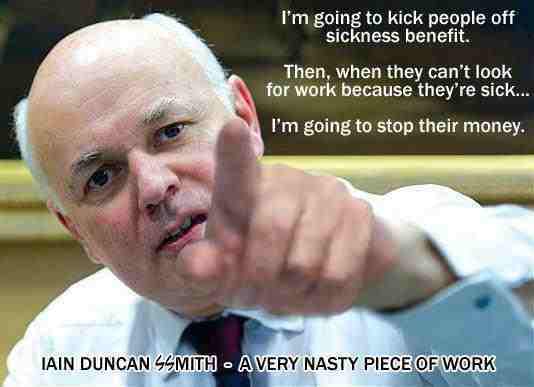 Another statement by Duncan Smith later in the month also drew criticism and a reprimand. The minister said around 1 million people have been stuck on benefits for at least three of the last four years “despite being judged capable of preparing or looking for work”. However, the figures cited also included single mothers, people who were seriously ill, and people awaiting their assessment. Grant Shapps was also rebuked by UK Statistics Authority for misrepresenting benefit figures – Shapps joined his fellow Conservatives in the data hall of shame. In March, the Tory chairman claimed that “nearly a million people” (878,300) on incapacity benefit had dropped their claims, rather than face a new medical assessment for its successor, the employment and support allowance (ESA). The figures, he said, “demonstrate how the welfare system was broken under Labour and why our reforms are so important”. The claim was faithfully reported by the Sunday Telegraph but as the UK Statistics Authority has now confirmed in its response to Labour MP Sheila Gilmore (the complainant), it was entirely and intentionally fabricated. In his letter to Shapps and Iain Duncan Smith, UKSA chair Andrew Dilnot writes that the figure conflated “official statistics relating to new claimants of the ESA with official statistics on recipients of the incapacity benefit (IB) who are being migrated across to the ESA”. Of the 603,600 incapacity benefit claimants referred for reassessment as part of the introduction of the ESA between March 2011 and May 2012, just 19,700 (somewhat short of Shapps’s “nearly a million) abandoned their claims prior to a work capability assessment in the period up to May 2012. The figure of 878,300 refers to the total of new claims for the ESA closed before medical assessment from October 2008 to May 2012. Thus, Shapps’s suggestion that the 878,300 were pre-existing claimants, who would rather lose their benefits than be exposed as “scroungers”, was entirely wrong. As significantly, there is no evidence that those who abandoned their claims did so for the reasons ascribed by Shapps. However, he did at least honestly reveal his own prejudices regarding disabled people, at least. But he did so without a trace of shame and remorse. At the time Iain Duncan Smith dismissed the findings, saying that he “believed” that he was “right”, anyway. It seems that Iain Duncan Smith has some disdain for evidence-based policy. “I believe this to be right, I believe that we are already seeing people going back to work who were not going to go back to work,” he said. This is a remarkable claim, given that the Department for Work and Pensions does not track the destination of people no longer entitled to benefits. Simply measuring how many people no longer claim benefits does not accurately reflect the numbers of those actually moving into employment. The DWP off-flow figures will inevitably include many having their claim ended for reasons other than securing employment, including sanctions, awaiting mandatory review, appeal, death, hospitalisation, imprisonment, or on a government “training scheme” (workfare). It seems unlikely, however, that accuracy will replace Duncan Smith’s “gut feelings” and ideologically-driven rhetoric – which is aimed at presenting excuses for the steady reduction of support for the most vulnerable citizens – any time soon. 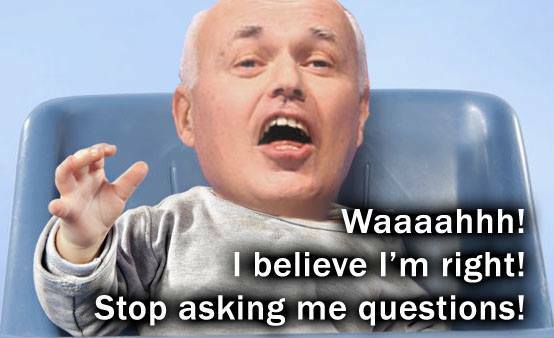 This man has got to be sorted as he has done great damage to the disabled by lying and letting people believe that the welfare is a gift and not a means to leading a dignified life. This government should hang their heads in shame and this should go viral and put right the wrong that they have done. The pictures alone sum up this sorry excuse for a human being, the story just enhances how despicable he really is. KITTY PLEASE READ MY FACEBOOK PAGE AND SEE WHAT I HAVE SHARED FROM THE DAILY MAIL AS TO WHAT SOME ONE WHO HAS WRITTEN ON THEIR FORUM THIS HAS GOT TO STOP POINT BLANC I AM APPALLED . I have lost Incapacity Benefit as I was unable to write the Work Capability Assessments. I went to tribunal after losing much weight due to stress and anxiety. I was told fit for work. I scored 12 points out of 15. I was told by an MP fill in ESA form. JC+ filled this in for me and that had many mistakes that I had fraud squad telephoning me. I was told the call is recorded and they said we noticed you recently sold a house and I had stocks and bonds. I said I never owned a house in my life. I don’t even have stocks and bonds. I never gone into the stock market for shares. They then said we investigate this more. Month later I got on ESA Work Capability Group. My support worker told me I should be on Support group. I telephoned ESA and enquired about support group and how to get it. I wrote a letter as stated from the telephone conversation. However, I was never told get evidence included with the letter. I had a letter back stating the DWP are correct with their decision and if I want to I can appeal. I put an appeal. I gathered all evidence. When the tribunal arrived 12th May 2014 I went to the waiting room and I was wheezing. I asked a clerk could my partner speak on my behalf? This was not allowed by the Judge. Even though, I have the right to advocacy. The Judge talked one minute about the introduction. I had severe asthma attack. The Judge and doctor looked at me and I was struggling to breathe. I had tears down my face. The Judge said he’s putting it on. My helper said I wasn’t and never seen me like this. She begged for help. Eventually the doctor checked me. She told the Judge dial 999. She realised I wasn’t putting it on. She said pulse rate very rapid. She gave me a bag to breathe but I was unable to breathe. I was physically sick. I thought I was going to die. Paramedics took me to hospital and I was lucky to be alive. Few days later I had a letter stating I was in support group of ESA. I scored 27 points. The panel investigated the papers without me present. Shocking of how I was treated is shocking to say the least. That’s a terrible ordeal you went through and I am so sorry, Malcolm. Sounds like you had a full blown panic attack, and they are serious – you do feel like you are going to die, and that then triggered your asthma – which is life threatening, Panic attacks by themselves are terrible – much much worse than anxiety. The government are playing with our lives and don’t care. I am glad to hear you are now in the support group and will be left alone for a while, at least. Hopefully, net year a new government will put this right. So if you ‘languish on [esa] for 3 out of 4 years’ you are a scrounger, but also if you go back to work you have then ‘closed your claim to avoid an assessment’, and are still a scrounger. It’s an old article but worth keeping note of everytime IDS accuses disability campaigners and opposition MPs of “lying” when we raise concerns about the WCA-related mortality statistics.